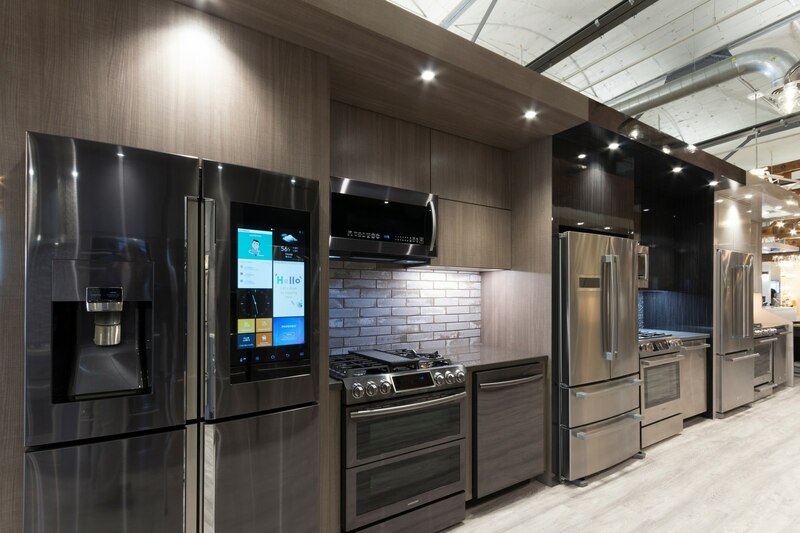 You should consider LG and Samsung for your kitchen. You probably would not have thought of either brand even 5 years ago, but they are now the fastest growing brands in the US. Samsung is the most popular single brand. Yet, you do not read much in terms of comparison.  It can be frustrating because both brands seem similar. They are both Korean and especially strong in laundry and refrigeration. In this article, you will learn a bit more about both companies, when they promote, their reliability, problems, and we'll compare their best packages. These companies are rivals, but they are almost interchangeable. Both companies sell TVs, phones, and appliances. They sell and promote in similar ways to the same customers. Both are extremely innovative and emphasize design as well as function, which is the foundation of their popularity. In appliances, they both started in laundry, then French door refrigerators, and lastly, cooking and dishwashers. They are also pioneers in the new Black Steel finish. Their original strategy when selling TVs was to heavily discount during the holidays. Consumers in the US tend to plan their shopping around Black Friday and other holidays like Labor Day, Memorial Day, and President's Day. These were the best times to buy expensive merchandise like a TV. Appliances do not follow the same pattern. You will replace your refrigerator when it breaks. In kitchen packages, you will need appliances at the end of your renovation. Still, LG and Samsung promote appliances as electronics. You should try to purchase their appliances during the holidays. The savings could be as much as 30%. However, you probably won't wait with a broken refrigerator. Based on our 30,761 service calls in 2017, both LG and Samsung are statistically reliable. Samsung is number 10 at 10.9% service within the first year. LG is number 3 at 5.34%. It does not mean LG is twice as reliable. We sell more Samsung in the kitchen whereas LG is more the laundry brand of choice. That said, laundry is more reliable as a category than refrigerators or stoves. You read about LG and Samsung problems all over the internet. The product is reliable and not any harder to fix than any other brand, but the issue is in certain parts of the country, it is very hard to find a technician to fix the product. So you want to know who can fix either brand before you buy LG or Samsung. For comparison, let's look at similar products and prices. Both packages include a counter depth refrigerator, front control stove, dishwasher, and microwave. LG has the icemaker on the door rather than inside the refrigerator for a bit more space. Their ice dispenser is taller, so you can place a larger pitcher underneath. However, Samsung is larger at 22.5 cu ft. vs 20 cubic feet. It is the most popular refrigerator sold at Yale because they have the most interesting styles in 4-door and Smart Refrigerators. Both are five burners with convection ovens. However, the heat is blown exclusively from the back of the LG for even heat. You should technically bake a bit better in a LG. 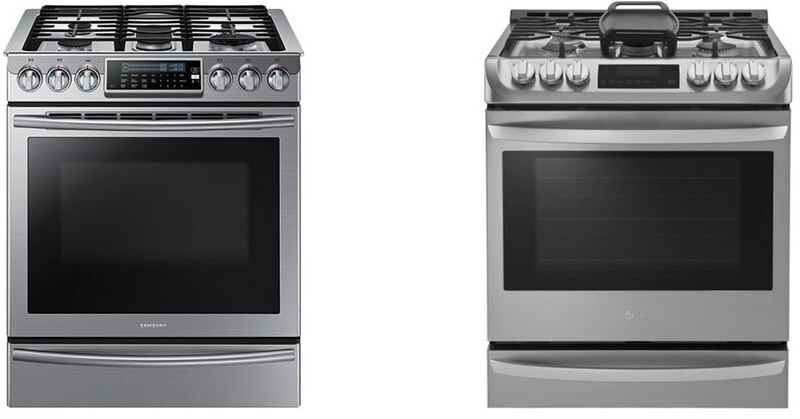 Samsung, on the other hand, has the more powerful cooktop with 18 and 15,000 BTU burners versus just an 18,500 for the LG. Samsung also adds a warming drawer below instead of storage below, so you can keep food or plates warm for up to three hours. We do not sell many LG dishwashers and only the basic Samsung dishwasher. They both have more expensive dishwashers with new technology. Samsung has the WaterWall system and LG has new steam based dishwashers. 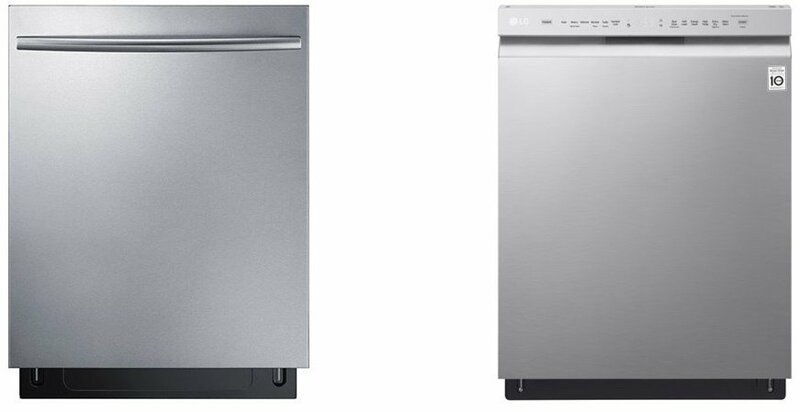 The basic Samsung dishwashers are very reliable at just under 5% service within the first year. Over-the-range microwaves were once made in two places and labeled with different brands. 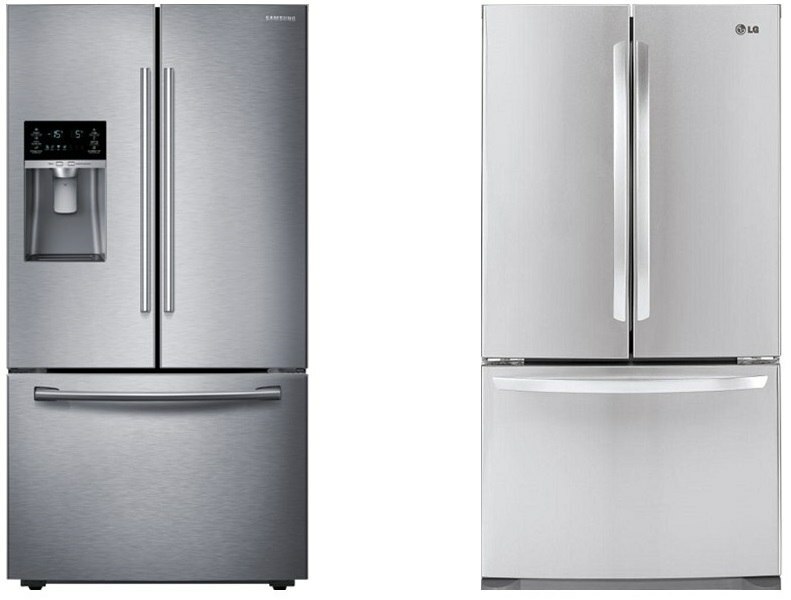 These two look similar except the Samsung has greater CFMs at 400 vs LG's 300 CFM. As I said in the beginning, both are very good brands. LG has a few appliances worth considering, but they are limited, especially in cooking. 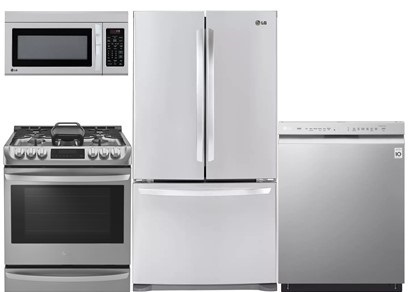 Samsung has slightly better kitchen appliances with more selection, especially in the refrigerator and cooking categories. For this particular comparison, if you truly like to bake, check out the LG. 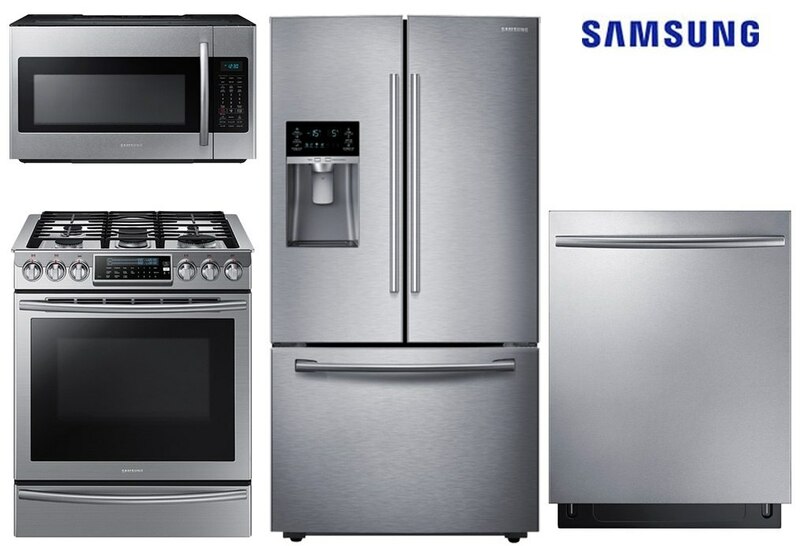 The Samsung has a more powerful stove and a larger refrigerator. Download our Appliance Buying Guide with features, specs, and inside buying tips to every major brand. Well over 240,000 people have read a Yale Guide.